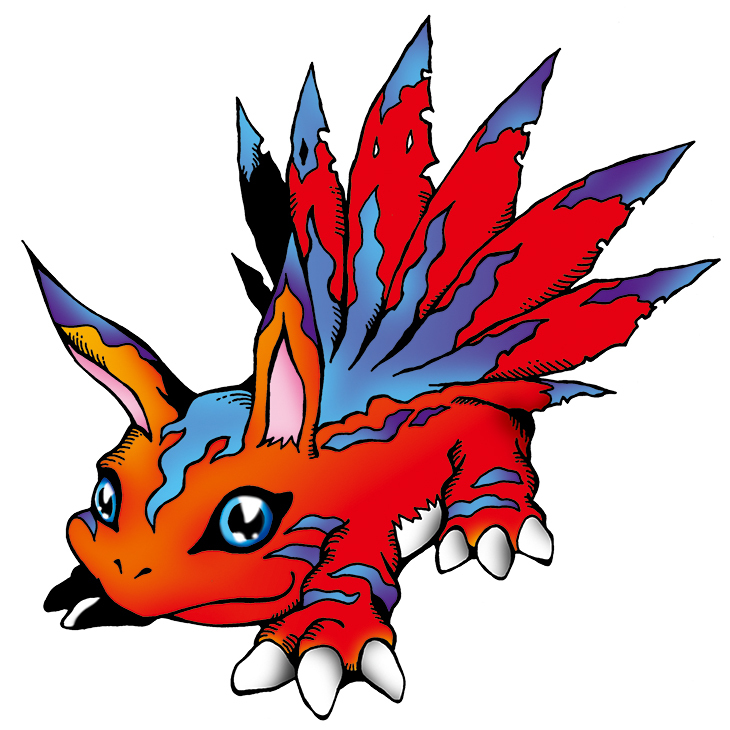 A Mammal Digimon that retained Tunomon's mammal-like elements and evolved. 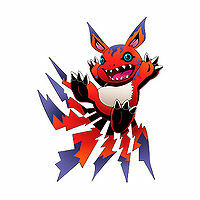 It's very curious and lively, and inherited its prank-loving personality from Tunomon. Also, Elecmon possesses nine tails, and during battle, it fans out its tail like the plumage of a peacock to intimidate its opponent. Its Special Move is "Sparkling Thunder". 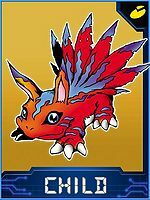 A Mammal Digimon that retained Tunomon's mammal-like elements and evolved. 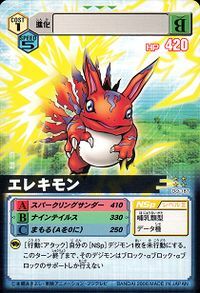 It's very curious and lively, and inherited its prank-loving personality from Tunomon. Also, Elecmon possesses nine tails, and during battle, it fans out its tail like the plumage of a peacock to intimidate its opponent. — Digimon Adventure: "Adventure! Patamon and I"
adj., From electric (「エレキトリック」 Erekitorikku). 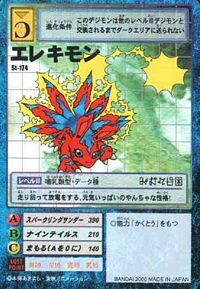 スパークリングサンダー Supākuring Sandā Super Thunder Strike/S-Thunder Smack/Thunder Cloud/Sparkling Thunder Shoots a powerful bolt of lightning. Tai Atari  Body Blow たいあたり N/A Body Attack Rushes at the enemy and body slams it. 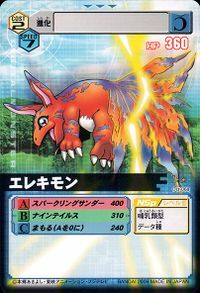 ナインテイルス Nain Teirusu Nine Tails Flips at the enemy and slaps it with its tail. サンダーナイフ Sandā Naifu Lightning Knife Sends a barrage of small blades of electricity at the foe. Elecmon was the guardian of the Village of Beginnings. Another two Elecmons were victims of the Digimon Emperor. An Elecmon realized and wreaked havoc in the city by jamming signals at junctions, causing massive car crashes before evolving into a viral Garurumon. An Elecmon was one of the many frozen victims of Ice Devimon. An Elecmon is one of the pâtissières imprisoned by Matadrmon. 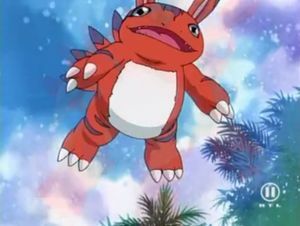 An Elecmon was one of the digimon trapped into a balloon of Airu's Opossumon. There were some Elecmon in front of Fugamon and Ogremon's restaurant in Digi-Quartz. 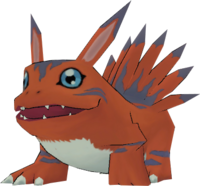 Elecmon appears as an obtainable Child-level Vaccine type Digimon in Digimon World. An NPC Elecmon is found at the north west of Gear Savannah, pacing around a tree. If the Player talks to Elecmon, it will electrocute the Player's Digimon, and if the Player keeps talking to it, it will keep electrocuting the Digimon for a total of 3 times, each shock doing more damage than the other. After that Elecmon says that it was testing the Player and Digimon's braveness and will join the city. Elecmon doesn't really do anything after being recruited other than stacking up Prosperity Points and installing up recesseds in the main square of the City and illuminating it at night, serving as a mere decoration purpose. Bakemon (Elecmon can evolve into Bakemon by either naturally or via Death Evolution. When it fights against another Digimon and loses a heart. This has a random 10% chance of happening so its reccomended to save before trying it). Once the enemy is near contact with Elecmon, it will release sparks and electrocute the enemy. Elecmon is an obtainable Digimon. Can evolve to Tyranomon (0-2 DP), Flare Lizarmon (3-5 DP) or Monochromon (6+ DP). 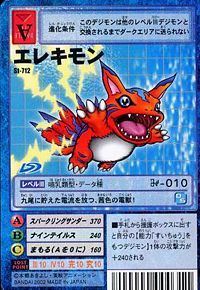 Elecmon appears as an obtainable Green Card. Can be found at Forest of Peace. As an obtainable Digimon, evolves from Zurumon at level 11, and evolves to Leomon at level 21. 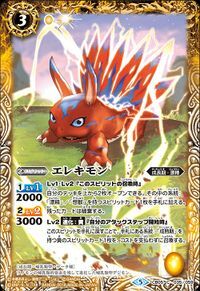 Elecmon evolves from Tunomon with passing time and evolves into Centalmon with 4 after battles, Kyubimon with 20 Beast AP, Thunderballmon with 20 Machine AP or Red Vegimon with passing time. Elecmon only appears in the opening animation of the game. Elecmon is the partner of Tamada Keito. 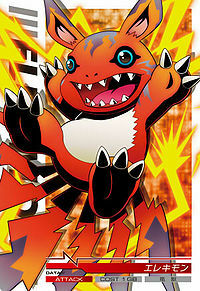 Evolves from Tunomon. Can evolve to Angemon, Yukidarumon, Birdramon, Whamon or Vegimon. Elecmon is an enemy Digimon in Area 3. Evolves from Mochimon. Can evolve to Centalmon, Tyranomon or Scumon. 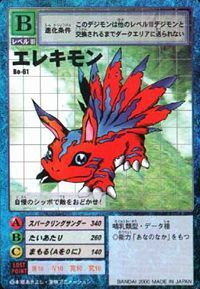 Evolves from Pinamon, Kyaromon or Chapmon. Can evolve to Peckmon, Reppamon, Gawappamon, Starmon or Bakemon. Elecmon is an enemy Digimon. This cheery and mischievous fellow runs around discharging electricity! This red electric beast releases the electricity it has stored in its nine tails! It takes pride in its tail, which it uses to threaten enemies! A Digimon that evolved from Tunomon. Extremely curious and energetic, it has a mischievous personality. In battle, it spreads its nine tails like peacock feathers in an attempt to intimidate the enemy. 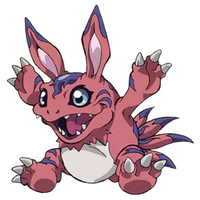 A Mammal Digimon that retained Tunomon's mammal-like elements and evolved. This page was last modified on 15 March 2019, at 17:19.